To get a smooth, paint-worthy surface without the dust of dry sanding, follow these pro-tested tips. 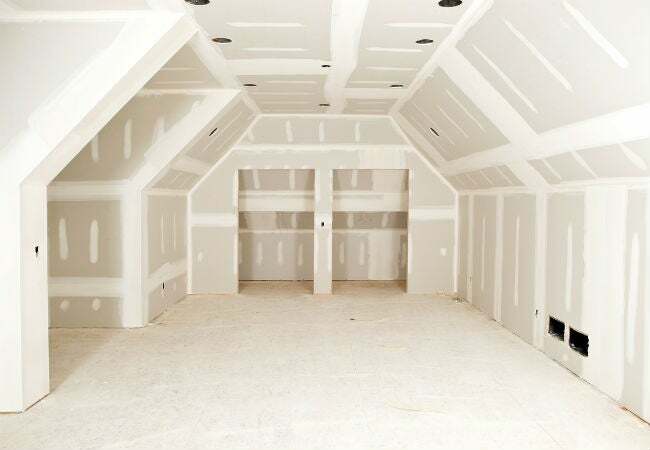 When it comes to interior walls, drywall has a lot going for it. It’s inexpensive, fairly easy to install and repair, and holds up well to life in the average household. But drywall requires fairly extensive sanding before it can be painted—unless you like the look of bumpy, lumpy walls with visible creases between the joints. And sanding drywall means dust. So much dust, in fact, you might be tempted to build with medium-density fiberboard (MDF) instead. But while MDF doesn’t demand as much sanding to provide a nice, smooth surface for paint, it responds poorly to fluctuations in humidity, tending to crack from expansion and contraction. Fortunately, with the right technique, you can wet sand drywall to cut way down on dust and still get an ideal surface for paint. Read on for pro tips so you’ll know what to do—and what not to do—to achieve flawless results. Wet sanding is time-consuming: If you’re really in a hurry to finish prepping drywall for paint, you’re better off dry sanding. Though keep in mind, when you dry sand, you’ll still spend quite a bit of time cleaning up the dust. Wet sanding drywall requires minimal cleanup, so the overall time spent is comparable for the two methods. Wet sanding drywall generally leaves very gentle waves in the finished surface, due to the flexible nature of the drywall sponge. This can be turned to your advantage if you’re patching a textured wall; it’s much easier to match texture with a damp sponge than with sandpaper. Just use your sponge to dab, wiggle, and pat the drywall mud—which is used to conceal the tape that holds sheets of drywall together—until it matches the texture you’d like to duplicate. Wet sanding calls for plenty of water, so use a five-gallon bucket, and fill it three-quarters of the way with warm water, which helps soften the drywall mud. This way, you won’t have to stop and refill your bucket too often. DO use the right sponge. While any stiff sponge will do the job, you’ll get the best results with a drywall sponge specifically designed for wet sanding (like this sponge from QLT for Marshalltown on Amazon). These specialty sponges are thick and stiff, with one side slightly abrasive for the first pass of sanding and the other side is soft and fluffy, for the second pass of smoothing the drywall mud. Submerge the sponge fully in water until it’s soaked, then squeeze out the excess so that the sponge damp but not dripping. If sanding a full wall, have two or three sponges available, in case one wears down too much or tears during use. For small patching jobs, one drywall sponge should be sufficient. Wet sanding drywall is somewhat tedious, but resist the temptation to speed the process by scrubbing aggressively at lumps and rough patches in the drywall mud. Doing so can create craters and holes you’ll end up having to fill. 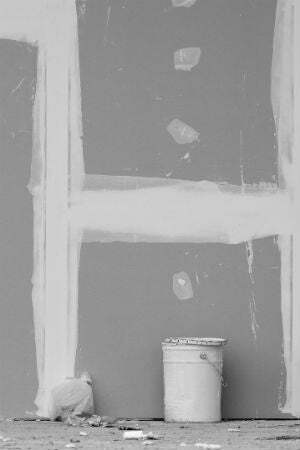 An overzealous approach can also lift or tear the drywall joint tape underneath the mud. DO focus on bumpiest areas. Start off with wide gentle strokes to soften the entire stretch of drywall mud, and then focus on the uneven or ridged areas, using circular motions to smudge out the imperfections. Let the sponge and the water do the work—not the strength of your hand. Aim to smooth away imperfections without creating valleys or holes. DON’T forget to rinse and rewet. 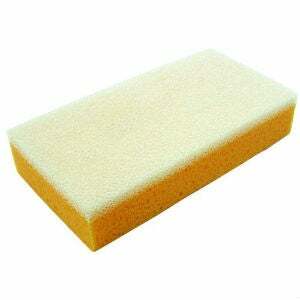 As you work, your sponge will collect drywall and mud, reducing its ability to smooth away imperfections. Remember to rinse your sponge thoroughly in the water bucket whenever it becomes too dirty, and then squeeze out excess water before returning to your task. DO change the water as needed. The water in your bucket will turn milky and thick after several rinses of the sponge. Dump the murky stuff and refill the bucket with fresh water to make it easier to clean your sponge. If pouring the water down your sink drain, flush with hot water to prevent any buildup in the pipes. DON’T make more than two passes. The worst of the ridges and bumps should be erased during your first pass with the abrasive side of the drywall sponge. During the second pass, focus on smoothing the edges of the drywall mud and achieving the most perfect surface possible, using the fluffy side of the sponge, designed to minimize small imperfections. If two passes aren’t enough, you’ll need to let the drywall dry, and then use sandpaper to finish the job. Repeated wet sanding beyond two passes soaks the drywall too much, leading to craters, valleys, and melted spots.